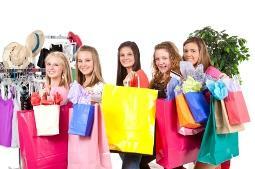 The Mall Madness game has been played by generations of preteen girls who love to shop. From its original release to today's most recent version, the game has improved along with technology and continues to be a fun amusement for the tween set. Mall Madness was released in 1988 by Milton Bradley. With a pink box and plenty of colors on its game board, the game was aimed at preteen females who would usually love to frequent a real life mall. A talking, electronic version rolled out the following year, and this was when the game really peaked in popularity. This happened thanks to an inundation of commercials on TV, as well as advertising by word of mouth as little girls received the game at birthday parties and during the holidays. Milton Bradley went on to redesign the game in 1996, and then released another version in 2004 to reflect the relevance of changing times and trends in actual physical malls. Miscellaneous parts used for game construction and to set the ambiance of a mall are also included. When the game board is assembled correctly, it looks like a two story mall. Using the electronic computer, players follow the directions according to the computer's narration. The male voice in the computer alerts a player about sale and clearance items, while a female voice narrates the actual game play. Two slots on top of the computer allow players to buy items and/or use the "bank." Players were also able to visit four distinct areas: Arcade, Ice Cream Store, Movie Theatre, and Restrooms.To win the game, a player needs to purchase six items on her shopping list and get back to the parking lot before the other players. You can increase the game to as many items as you want on your list, with more advanced players typically advancing the list to ten items. Each player gets 200 dollars from the banker at the start of the game. The computer button is pressed and tells each player how many spaces to move. When a player reaches a store, she can make a purchase using a credit card, which the computer records. The player then gives cash to the banker to pay for the item. Sale and clearance items are announced during the game, and players can advance more quickly by getting to these in time. In more recent years, different versions of the Mall Madness game have been released, including versions that feature Hannah Montana and Littlest Pet Shop. The game is played in the same format, only the pieces and talking computer is themed after the Hannah Montana TV show or the Littlest Pet Shop pets. 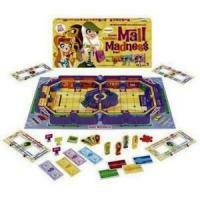 Mall Madness continues to be as popular with young girls today as it was in the 1990s. Securing a copy of this game is easy, either by shopping online or visiting your local toy store. With a lot of little pieces, this game is designed for those aged 9 and up, and most kids will lose interest in it before high school. Be sure to brace yourself for a real trip to the mall once the little girl in your life is inspired by the game play!